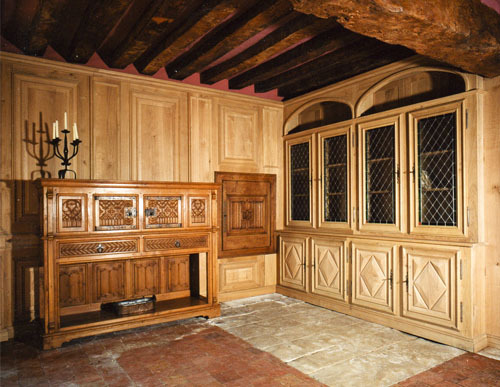 We specialize in the fabrication of medieval furniture in the "Haute Epoque” style. This period, covering three centuries, witnessed an unprecedented blooming of artistic and religious activity. We strive to use construction methods from this epoch, and borrow the same decorative elements. We use oak from Burgundy and French walnut. We make our own glass work as well as some of the hardware. Each piece of furniture is unique.